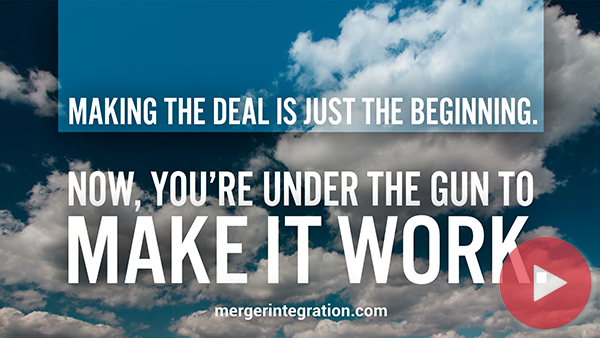 Employees find lots to gripe about when they’re being acquired and merged. Looking back across my three decades of consulting on M&A, though, one complaint stands out clearly as people’s #1 gripe. I honestly cannot think of a single client I've worked with where the integration proceeded too rapidly to suit people in general. Fast they can live with, but across the board, people hate slow. And the longer the drive, the more the mood sours. People want you to wrap it up! They’re aching for it to be over and done. Now that I think about it, I can’t recall ever urging a client to slow down the integration process. Maybe I did somewhere along the way. But ordinarily I’m pushing to accelerate things—not merely because the workforce prefers fast integration, but because speed is a major contributor to merger success. Finally, here’s my dogma: You can integrate faster than you think you can.